Home›Reviews›Autograph Turns Up the Radio in Sin City at Count's Vamp'd! Autograph Turns Up the Radio in Sin City at Count's Vamp'd! 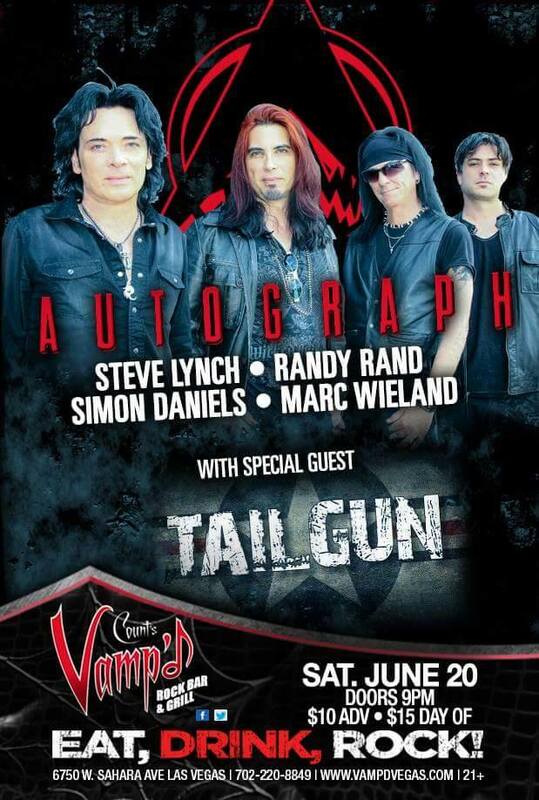 Autograph played Count's Vamp'd on Saturday, June 20, 2015. TailGun was the support act for the evening. In the 1980s, Autograph came on the music scene and had a brief but brilliant moment in the spotlight, with hit records and MTV videos. “Turn Up the Radio,” a single from their 1984 debut, Sign in Please, became one of the most recognizable rock anthems of the Decade of Decadence, remaining revered as such to this day. While the band had some subsequent hits and modest popularity that followed, nothing approached the impact of that iconic single. Autograph’s classic lineup from their 80s heyday consisted of Steve “Plunk” Plunkett, Randy Rand, Steve Lynch, Wayne Isham, and Keni Richards. Of those members of the band, only Rand and Lynch remain. Plunkett is now pursuing other projects, Isham died of cancer several years ago, and Richards is unable to participate for health reasons. Filling the voids are new members Simon Daniels (of Jailhouse) and Marc Wieland. The group is now performing as a four piece, with no keyboard player. Kicking off the evening’s festivities was TailGun, a rock band from Vegas that is winning me over with each and every show that they do out here. The band’s “back to basics” hard rock sound, complete with sets comprised mostly of original material, ranks amongst the best of its kind; I would compare thir sound favorably to groups like AC/DC, although their sound is certainly not limited to a narrow scope musically. Each time I see these guys, they have more original songs to perform, and manage to impress larger audiences. Dru Jaxin (formerly of the Aces High Iron Maiden tribute) is easily one of the most charismatic and interesting frontmen to watch in action on stage; anyone who has followed the Vegas music scene in recent years knows this. As the group records more original material, a full-length album is likely on the horizon; something this fan is looking all the more forward to. "I Lost My Mind in America" is one of two new singles from the reformed band. Autograph’s performance was one this fan was eagerly awaiting, having been a huge fan of their music over the years but also having never seen any version of the band live before (I have a valid excuse…. I was a baby during the band’s heyday!) Stripped down to a four piece with only half of the band consisting of classic members, it is not unlikely that a certain segment of the fan population would have some initial doubt as to whether or not the band could actually deliver, three decades after the release of their biggest hit, and with many of the classic members gone. One thing I noticed right away with this performance is that it rocked harder and heavier than I would have expected. The group lacks a keyboard player in its current incarnation, and Jailhouse vocalist Simon Daniels definitely brings his own thing to the table. The result is a tight-knit band that stays true to the classic sound, but also manages to modernize and rock harder and heavier than they did in the past, without sacrificing what made them who they were to begin with. The band members, old and new alike, clearly had chemistry together; clearly this is NOT yet another instance where band member changes bring a band down, but rather the happy exception to the rule. The fact that the current version of the band has recorded new singles together should say something as well. This new incarnation of Autograph absolutely delivers on a live stage; no one at Vamp’d last night would disagree with that. Some songs would have benefited from the presence of keyboards, but I was too busy rocking out and having a good time to care. Everyone else there felt the same way. Setlist from the band's show, signed by all four current members. The band did slightly deviate from the setlist pictured, including adding performances of their newly recorded singles. The setlist itself was worth mentioning as well, comprised primarily of rock anthems from the band’s classic heyday, but also incorporating some of the new songs as well. These new songs flowed seamlessly into the setlist and fit in perfectly. Hopefully, in time, we will be getting a new full-length album from the band. Between song banter and other chatter was kept to a minimum for the duration of the band’s set. Of course, they saved their biggest and most iconic hit of all until the very end, and you could tell that building that sense of anticipation paid off. This evening was everything a rock show should be; no one there would beg to differ. By far the highlight of the night for me was Steve Lynch’s guitar solo. Known for one huge pop hit in the 80s, the group is one that never gets enough credit for their actual musicianship, and nowhere was this better proven than with Lynch’s solo. Taking center stage and letting his finger work do the talking, he beautifully demonstrated why he is one of the most underrated guitarists of his era. All these years later, his playing has lost nothing; a rarity in this business. 2015 is shaping out to be one of the best years in Vegas rock and roll, and Autograph’s set at Vamp’d was further, continued proof of that - as far as band bookings go, Vamp'd is on a roll. Of course, Autograph is back from the dead and doing what they do best, playing classic hits and new material alike, the latter of which has fans optimistic for more. If the current incarnation of Autograph hits up your town, do not hesitate to go to the show. The group sounds as good as they ever have, and will rock you from start to finish. Turn it up!